Puritan John Winthrop gazed at the shore from the deck of the ship Arabella in 1630, and told the new colonists, “For we must consider that we shall be as a city upon a hill.” President Ronald Reagan adapted the imagery to describe America’s role as a bearer of the light of liberty. Our founders believed that the architecture of public buildings should symbolize the principles of the new Republic. The American Village -- designed to be a classroom, a stage, a theatre, and museum of ideas -- is evocative of America's founding. Set upon a hill, and modest in scale, the American Village offers a beacon of liberty. at the end of Constitution Green, 1999. Independence Circle represents Liberty drawing the thirteen colonies together in common cause. Atop the hillside, Constitution Green represents the enshrinement of that liberty within the Constitution. Around that green are major structures representing the Executive (Washington Hall), Judicial (Courthouse), and Legislative (future Independence Hall) branches of the Republic. Other elements of the master plan have changed and been refined, but the core elements have remained. Now in the plan, Magazine Street traverses the grand avenue, linking the lower part of the campus to a powder magazine, and then beyond along the Freedom Trail and replica of Concord Bridge. 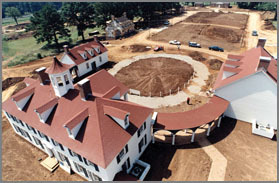 When the American Village opened the Board of Trustees publicly cited “The American Village is possible only because of the extraordinary vision, leadership, and perseverance of Tom Walker.” A few years later it awarded him its highest honor for his visionary leadership and persistence in founding of the American Village. He conceived of the idea of a place to engage young people in the stories of liberty – as a foundation for their becoming good citizens and leaders. In 1993 he began publicly speaking and advocating for the creation of such a place. He worked with citizens and officials. In 1995 the Citizenship Trust was officially chartered by legislative act sponsored by the late Rep. Al Knight and then Sen. Frank C. Ellis, Jr. as a 501(c)(3) non-profit educational institution, and in 1998, then State Representative Johnny Curry authored the first public funding support, and on November 30, 1999, the American Village campus opened. Since 1994 Walker has collaborated with Mike Hamrick, an extraordinarily gifted architect of Eufaula, Alabama. Their collaboration focused on shaping and creating a vision of both the campus as a whole and of its individual components. Since 1994, Walker and Hamrick, with support of the Board of Trustees, and other stakeholders, have sought to create a campus that is emblematic of America's heritage of liberty and self-government. This village "set upon a hill" is emerging more and more as a nationally-distinctive campus.